The 72km Bronte Way enjoys an absorbing theme, linking a host of locations associated with the lives of the Bronte family. The route stretches from Oakwell Hall near Birstall in Yorkshire to Gawthorpe Hall near Padiham in Lancashire. 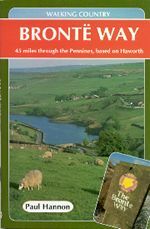 Despite the exemplary theme, walkers with absolutely no interest in the Brontes will still find this a facinating and thoroughly enjoyable walk. Bronte admirers, of course, will derive immense pleasure from the associations of this journey. The route of the Way embraces a remarkable variety of surroundings from canal towpath to windswept moor, including historic fieldpaths linking old textile settlements, and surprising wooded valleys so near urban communities such as Coley Beck and Thursden Brook. The central section crosses the backbone of England, the Pennine watershed linking Yorkshire and Lancashire. These moorland miles can be extended to bring in memorable detours, notably to the atmospheric setting of Top Withins, the commonly enduring image of Emily's 'Wuthering Heights' and also to the bristly crest of Boulsworth Hill, perhaps the Way's finest landmark.The Way naturally visits Haworth, where the Parsonage, now a museum, was home to the Bronte family. It also visits Wycoller Hall which was used in the novel 'Jane Eyre' as Ferndean Manor. Each of these sections offers a steady day's ramble with good or easily arranged transport links. Accommodation prior to the start of the walk can be found at Birstall, close to Oakwell Hall and is also available at Shelf, Haworth and Wycoller. On completion of the walk accommodation can be found at Padiham close to Gawthorpe Hall. 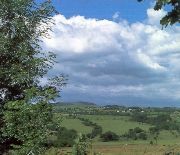 The Bronte Way also lends itself to walking in separate day sections, with many West Yorkshire and East Lancashire conurbations close to hand. There are ample bus services at numerous points along the way including the start and finish points of the suggested stages. The route is waymarked with a yellow arrow on a magenta background for much of the way, although some can be easily missed. In places the route is coincident with other long distance paths whose waymarking takes precedence, so some care is required. Having the guidebook and OS Explorer maps is recommended to ensure reliable route finding, particularly on the moorland sections.